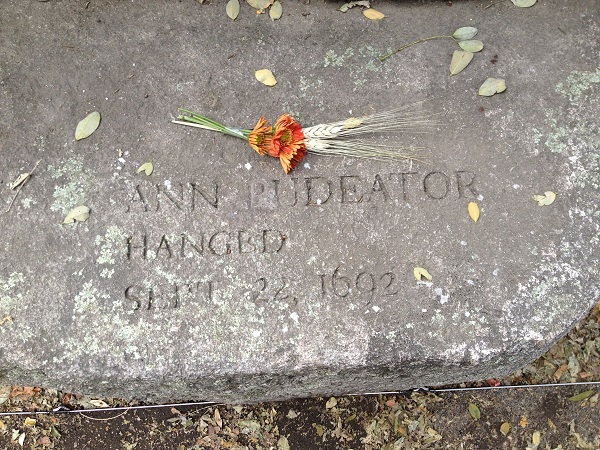 Ann Pudeator was a woman from Salem who was accused of witchcraft during the Salem Witch Trials. Very little is known of Ann Pudeator’s early life. She was born about 1621 but her maiden name and the place of her birth are unknown, although she was most likely born in England and later moved to the Massachusetts Bay Colony. At some point Pudeator married Thomas Greenslit and the couple had five children together, Thomas Jr., Ruth, John, Samuel, and James. Some historians believe that during the first years of their marriage the couple lived in Falmouth, Maine but later relocated to Salem, Mass. “In 1675, she was given the task of caring for Isabel Pudeator, the young wife of Jacob Pudeator of Salem. Immediately following Isabel’s explained death in 1676, she married Jacob Pudeator who was younger than Ann by nearly twenty years. It is likely these strange circumstances did not go unnoticed by the Salem community” (Goss 100). After Jacob Pudeator died in 1682, he left his property and estate to Ann, along with amounts of money as a legacy for each of her five children. “She was a woman of property, owning two estates on the north line of the Common; that on which she lived comprised what is between Oliver and Winter Streets” (Upham 185). Ann Pudeator was accused of witchcraft by Mary Warren during Warren’s examination on May 12, 1692. “Goody Parker told me she had been a witch these 12 years & more; & Pudeator told me that she had done damage, & told me that she had hurt James Coyes child taking it out of the mothers hand” (SWP No. 135.4). As a result, a warrant was issued that day for the arrest of Alice Parker and Ann Pudeator and they were both apprehended by Sheriff George Herrick and examined but the record of Pudeator’s examination has been lost. On May 13, Pudeator was sent to the Boston jail, according to a census of prisoners for that month (SWP No. 166.2). “She was arrested and brought to examination on the 12th of May. There is grounds to conclude, from the tenor of the documents, that she was then discharged. Some people in the town were determined to gratify their spleen against her, and procured her re-arrest” (Upham 185). Ann Pudeator was accused again, on June 1, during Sarah Churchill’s examination when Churchill confessed that she was a witch and accused Ann Pudeator of making her sign the Devil’s book. There is no record of an arrest warrant for Ann Pudeator in either June or July which means the warrant was either lost or Pudeator was still in jail at the time. On July 2, 1692, Pudeator was questioned at Beadle’s Tavern in Salem for a second time. Fortunately, the record from this second examination has survived. “Goodwife Pudeator, you have formerly been complained of, we now further inquiry. Here is one person saith you brought her the book which is Sarah Churchill. Look on the person. Says Churchill: you did bring me the book. I was at Goodman Jacobs’s. Pudeator said I never saw the woman before now. It was told Pudeator this maid charged you with bringing her the book at the last examination. Pudeator said I never saw the devil’s book nor knew that he had one” (SWP No. 113.3). Lieutenant Jeremiah Neale testified at the examination that Pudeator was an “ill carriaged woman” and that after his wife became ill with smallpox, Pudeator made a visit to their house to help his wife and asked to use their mortar. After doing so, Neale said his wife became worse and was now ill with a flux (dysentery), which she didn’t have before. Neale then explained that when Pudeator was arrested, his wife’s nurse said the lawmen came too late because his wife was getting worse and he said she died soon after. He also stated that Pudeator often threatened his wife but it doesn’t appear that he elaborated on this statement. “A: It was grease to make soap of. But why did you put them in so many things when one would have held all. But answered, not the purpose. But the constable said ointments were of several sorts” (SWP No. 113.3). “The evidence was, if possible, more frivolous and absurd than in other cases. The girls acted their usual parts, giving on this occasion, a particularly striking exhibition of the transmission of the diabolical virus out of themselves back into the witch by a touch of her body. ‘Ann Putnam fell into a fit, and said Pudeator was commanded to take her by the wrist, and did; and said Putnam was well presently. Mary Warren fell into two fits quickly, after one another;and both times was helped by said Pudeator’s taking her by the wrist’” (Upham 186). On September 5, a summons was issued for witnesses to testify at Pudeator’s trial as well as Alice Parker’s trial. The witnesses who were summoned were: John Westgate, John Bullock, Martha Dutch, Susanna Dutch, Lieutenant Jeremiah Neale, John Beckett, John Best Jr, John Louder and Sarah Parott. On September 6, several people testified against Ann Pudeator, including: John Best Jr, John Best Sr, Ann Putnam Jr, Samuel Pickworth, Mary Walcott, Sarah Bibber, Elizabeth Hubbard, Mary Warren and Sarah Churchill. Sarah Churchill testified that Pudeator had afflicted her by choking, pinching and pressing her, sticking her with pins and forcing her to touch the Devil’s book. She also said Pudeator brought her poppets and made her stick pins in them to afflict people. On September 7, Mary Warren testified that Ann Pudeator had afflicted her by biting, pinching and choking her and sticking her with pins, particularly on the day of her examination on July 2. Warren also said Pudeator tried to make her sign the Devil’s book and said Pudeator told her she was responsible for a man named John Turner falling out of a cherry tree, which almost killed him, and that she caused the death of Jeremiah Neal’s wife as well as the death of John Best’s wife and that she killed her own husband Jacob Pudeator. Warren also said she saw Pudeator afflict Elizabeth Hubbard, Mary Walcott, Ann Putnam and herself last night. Elizabeth Hubbard, Mary Walcott and Ann Putnam also testified that Pudeator afflicted them and the other girls last night. Sarah Bibber also testified that Pudeator afflicted her and the other girls at her examination and that last night she afflicted them with Mary Parker, declaring “and I do believe she is a witch” (SWP No. 113.10). Samuel Pickworth testified that he was walking by Pudeator’s house at night six weeks ago when he saw a woman who looked like Pudeator suddenly fly by him into Pudeator’s house. Ann Putnam Jr also testified that Pudeator’s specter told her she flew by a man one night into a house. John Best Sr testified that a few years ago his often heard his wife say that Ann Pudeator had bewitched her, by pinching and bruising when she was sick, and would not leave her alone until she killed her. John Best Jr confirmed this by testifying that he also heard his mother say that Pudeator had bewitched her and was trying to kill her and continued to say so until her death. He also said Pudeator often chided him for driving her cow off away from his father’s herd of cows, all of which made him “conclude said Pudeator was a witch” (SWP No. 113.15). On September 7, Ann Pudeator was indicted on one charge of witchcraft for afflicting Mary Warren. On September 10, after all the testimony against Ann Pudeator was heard, she was found guilty and sentenced to death. 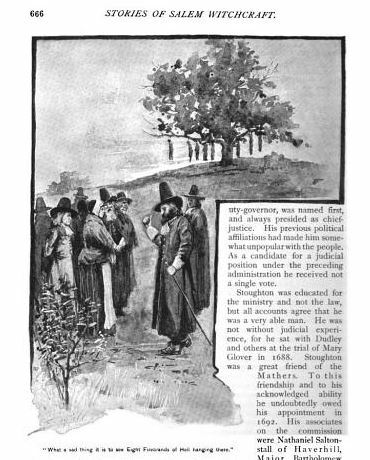 That whereas your poor and humble petitioner being condemned to die and knowing in my own conscience as I shall shortly answer it before the great God of heaven who is the searcher & knower of all hearts: That the Evidence of John Best Sen’r and John Best Jun’r and Samuel Pickworth which was given in against me in court were all of them altogether false & untrue and besides the above said John Best hath been formerly whipped and likewise is recorded for a liar I would humbly beg of your honours to take it into your judicious and pious consideration that my life may not be taken away by such false evidence and witnesses as these be likewise the evidence given in against me by Sarah Church [sic] and Mary Warren I am altogether ignorant of and know nothing in the least measure about it nor nothing else concerning the crime of witchcraft for which I am condemned to die as will be known to men and angels at the great day of judgment begging and imploring your prayers at the throne of grace in my behalf and your poor and humble petitioner shall for ever pray as she is bound in duty for your honor’s health and happiness in this life and eternal felicity in the world to come” (SWP No. 113.16). The petition seemed to have had no effect because Pudeator’s death sentence remained unchanged. On Thursday, September 22, 1692, Ann Pudeator was brought to the execution site at Proctor’s Ledge in Salem, along with Mary Easty, Alice Parker, Margaret Scott, Martha Corey, Wilmot Redd, Mary Parker and Samuel Wardwell. When the cart carrying the prisoners turned up the hill to the ledge, its wheels suddenly became stuck. According to Robert Calef, who attended the execution and wrote about it in his book, More Wonders of the Invisible World, while the law men struggled to get the wheels to move, the afflicted girls began to cry out that they saw the Devil holding the cart back (Calef 218). The men eventually got the oxen cart free though and the prisoners arrived at the ledge. At the execution, the prisoners all continued to declare their innocence until their last moments. When it was over and the bodies were still hanging, Calef said that Reverend Nicholas Noyes, who had officiated as clergyman at the hangings that day, remarked “what a sad thing it is to see eight firebrands of hell hanging there” (Calef 221). These were the last executions of the Salem Witch Trials. The victims were then cut down and temporarily placed in a nearby rocky crevice but it is not known what happened to their bodies after that. In September of 1710, a committee was sent to Salem to make restitution to the victims of the trials after a number of the surviving accused had filed petitions with the court asking that their names be cleared. For reasons unknown, none of Ann Pudeator’s relatives filed a petition with the committee. Nothing came of Jewett’s letter because on October 17, 1711, the Massachusetts Legislature passed a bill clearing the names of many of the accused, except for Ann Pudeator, Alice Parker, Bridget Bishop, Susanna Martin, Wilmot Redd and Margaret Scott. Due to the fact that the Pudeator family did not file a petition with the court, they were also not awarded any money in damages for Ann’s imprisonment and death. 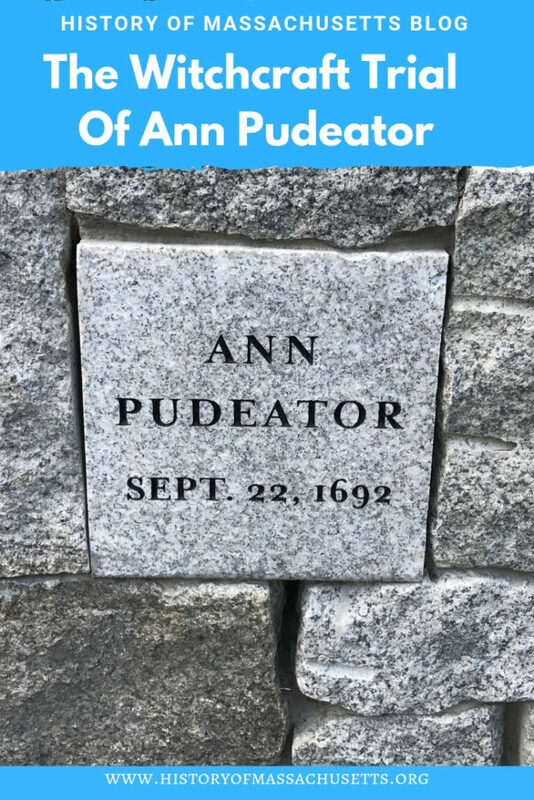 On the 300th anniversary of the Salem Witch Trials in 1992, the Salem Witch Trials Memorial was built in Salem, Mass and a marker was established for Ann Pudeator. 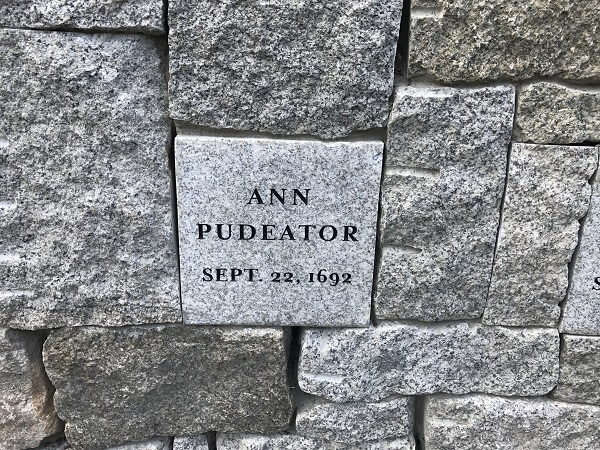 After the site of the Salem Witch Trials executions was discovered in 2016, the Proctor’s Ledge Memorial was built there the following year and a marker was established for Ann Pudeator. The location of Ann Pudeator’s grave has never been found. Address: 35 Washington Square North, Salem, Mass. Private Residence. No admission. Upham, Charles Wentworth. Salem Witchcraft: With An Account of Salem Village, and a History of Opinions on Witchcraft and Kindred Subjects. Vol. II, Wiggin and Lunt, 1867.